We ran across a posting about a geocache located along the Mojave Road. The return of cooler months to the desert invites exploration of the sprawling Mojave National Preserve just over the Nevada border in Southern California. Although the preserve contains few established foot trails, hundreds of miles of old roads and historic trails lead hikers, mountain bikers, cyclists, four-wheelers and equestrians to probe washes, canyons and mountains. Always carry at least a gallon of water per person and extra for your vehicle. Let a responsible person know where you are headed and when you plan to return. Administered by the National Park Service since 1994, the Mojave National Preserve sets aside a huge portion of the Mojave Desert, the smallest and driest North American desert. The preserve encompasses a rough triangle bordered by U.S. 95, Interstate 40 and Interstate 15, plus an area north of I-15 near Mountain Pass. Many areas of the preserve are less than a three-hour drive from Las Vegas. These highways provide easy access to the network of 2,200 miles of roads and trails into the interior of the preserve. Visitors can use passenger vehicles safely on major routes through the preserve, but many graded roads and dirt tracks require high clearance vehicles or four-wheel drive. Before venturing off main roads, consult a good map. Learn about current road conditions at the preserve's information stations in California at Baker, Barstow, Needles, Nipton, Goffs Schoolhouse Museum on Route 66 or the visitor center in the restored Kelso Depot. Built in 1927, the two-story Mission Revival building served train crews and passengers on the Union Pacific. Access the depot from near Nipton using the Morningstar Mine Road toward Cima and Kelso, the Cima Road from I-15 between Mountain Pass and Halloran Summit or from Baker on Kelbaker Road. The beautiful Kelso Dunes lie a few miles south of the depot. Visitors drive to them and park near the base of the 700-foot mountains of sand. Only foot traffic is allowed on these protected dunes. The soft, shifting sand precludes any defined trail, so it is a slog to the crest. The Cima Road passes the trailhead to Teutonia Peak, a developed trail. Watch for an informal campsite at Sunrise Rock 10.4 miles south of I-15 on the Cima Road. The four-mile trail begins nearby on the opposite side of the road, cutting through an extensive forest of Joshua Trees, a signature plant of the Mojave. Between Cima and Kelso, watch for the Cedar Canyon Road turnoff, an access to developed facilities, accessible from I-40 as well. Pavement soon turns to gravel through five flood-prone miles to the junction with Black Canyon Road. Turn south and look for a narrow two-mile road to Mid-Hills Campground, one of two developed campgrounds in the preserve. Continue south on Black Canyon Road to reach facilities at Hole-in-the-Wall, named for strangely eroded rock formations. Developments include a ranger station, housing for fire crews, an equestrian group campground, a 35-unit RV and tent campground, and two additional walk-in tent sites. Both campgrounds have tables, fire rings, parking pads, drinking water and centrally located toilets. Fire restrictions may be in force. Plan to use a camp stove for cooking. Camping fees apply, but no entrance fee is charged. Reservations are not accepted, except for the equestrian facilities. A popular eight-mile trail connects Mid Hills and Hole-in-the-Wall. Hikers, bikers and horseback trail riders often start from Mid-Hills, which sits 1,200 feet higher than Hole-in-the-Wall. They park transport vehicles at the visitor center/ranger station for the ride back, unless they want to do 16 miles roundtrip. Most people travel the Mojave Road in 4WD vehicles, but a few who possess more adventurous and hardy spirits choose alternate methods. You might enjoy "Cycling the Mojave Road," a travelogue with photos posted by someone who rode from the Colorado River to Zzyzx on a bicycle called the "Rough-Roadster." In our "travels" on the World Wide Web, we find many treasures. One of them is this photo essay posted on April 25 on YouTube. "Mojave Calling" is not specific to the Mojave Road, but it offers beautiful images of the amazing sights one encounters in the East Mojave. Enjoy! 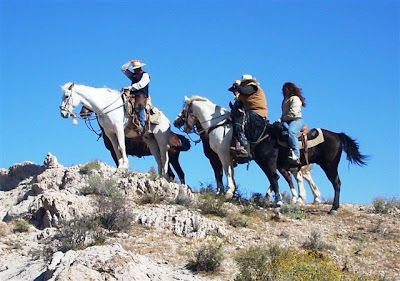 More than 50 riders joined the Norco Mounted Posse for their 23rd Annual Mojave Trail Ride April 6-12th. Among them were Jason Williams, wild horse and burro program compliance officer for BLM-California's Folsom Field Office, and Jo Ann Schiffer-Burdett of BLM's California Desert District Office. The equestrians started in Baker Camp, Mojave National Preserve, and rode 140 miles in six days along the Mojave Trail to Laughlin, NV. 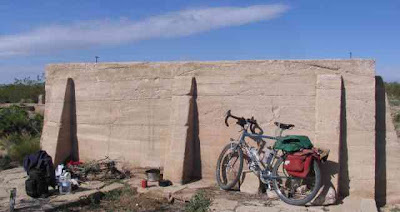 The ride traversed lands in the Mojave National Preserve, and the BLM Needles and Stateline Field Offices. Six hardy mustangs and their owners did a great job representing the BLM's Wild Horse and Burro program: Jason Williams with Stinger; Folsom Field Office Volunteer Compliance Officers David Miller and Doug Gorman with Dot; U.S. Forest Service packer Davey Eubanks, "Mustang Larry" and Sue Jackson. Two of the mustang owners -- Doug and Jason -- were on the drag team who helped riders in trouble repair broken cinches and saddles, assisted riders who fell off, and retrieved all of the cell phones, knives, tack, hats, ipods and assorted gear that fell off along the way. You can see more photos of the event in the original article. 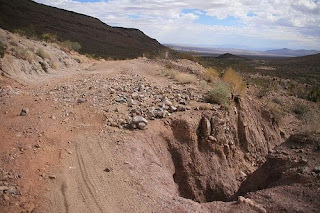 The following is a portion of a post about a volunteer project organized by the South District of the California Association of 4 Wheel Drive Clubs to repair washouts over the Piute Range (as seen in the slideshow in our 9/24/2005 post). We certainly appreciate their efforts to maintain the Mojave Road for everyone to enjoy. The South District of CA4WDC will host a conservation and rehabilitation project April 25 - 27 on the Mojave Road in conjunction with the National Park Service. The project will be on the portion of the Mojave Road that goes around Piute Hill to the south following the old AT&T Underground Telephone Cable Route. The road, as it approaches the top of Piute Hill, has several small washouts and two very large ones that need to be filled in. The project will be to rebuild the water bars that have been washed out and to place gabions in the two washed out areas. This corrective maintenance will be done to prevent further washouts and keep the road from being closed because of safety concerns. The work will consist of digging ditches to channel excess water off the road during storms to prevent the accumulation of water at the culverts, cleaning out the culverts, building water bars to direct water into the culverts and filling in the two badly eroded and washed out areas. The alternative to fixing the road is closure. The National Park Service manages the Mojave Road in this area. Park Superintendent Dennis Schramm and South District Vice President Harry Baker have entered into an agreement to have their two organizations work together to repair the washouts. The park service will provide the equipment and supplies needed to repair the road and the South District with help from others in the Off Road community will provide the manpower. The project will entail throwing a lot of rocks! Basically we'll be moving rocks from a stockpile area and filling in gabions and building water bars. Click here to access the complete post. This article appeared in the Los Angeles Times on March 13, 2008. The proposed National Landscape Conservation Act would unify management and funding of designated areas. But it requires 'national' in the area name, excluding some of the state's sensitive areas. Congress is considering permanent protection for 26 million acres of beautiful and historic landscapes in the American West, but has quietly excluded millions of acres of California desert. In a system that would rival the national parks and forests, the National Landscape Conservation Act would unify the management and funding for areas such as the original Pony Express National Historic Trail, Lewis and Clark National Historic Trail, a million acres of Alaskan caribou calving grounds, 38 wild rivers, Utah's Grand Staircase-Escalante National Monument, and a tiny ghost town near the Mexican border. But more than half of the 10.6 million-acre California Desert Conservation Area, which stretches from the Mexican border to Mono Lake, has been dropped on technical grounds. Because the word "national" isn't in its title, the conservation area doesn't qualify, according to U.S. Bureau of Land Management attorneys. Environmental watchdogs and some land bureau employees say the California area, created by Congress in 1976, is the cornerstone of the fledgling national system. They say the semantics hide political motives: Utility companies have proposed hundreds of miles of electrical transmission corridors through California's deserts, and off-road vehicle enthusiasts oppose further regulation of the area. "I don't think this is a technicality at all . . . That's a huge hit to desert conservation in California and the Southwest," said Daniel Patterson, director of the southwest office of Public Employees for Environmental Responsibility, which represents whistle-blowers in government agencies. The bill does include the King Range National Conservation Area, the Headwaters Forest Reserve, the Santa Rosa and San Jacinto Mountains National Monument, and just under half -- 3.7 million acres -- of the desert conservation area. Not included are more than 6 million acres of desert. Some of the land has been used for mining and off-roading, but much of it remains pristine, wide-open space. Patterson said that if the bureau's entire California desert system isn't part of the national system, its conservation designation "would be a protection in name only . . . The California BLM will lose funding, they will lose staff, they'll lose what conservation focus they might have." He said the excluded desert lands, including visually stunning and ecologically important areas such as Afton Canyon and Big Morongo Preserve, would be more at risk from proposed transmission-line corridors, among other projects. In addition, he said, "it could be expanded to off-roading, it could be expanded to mining, it could be expanded to land sales for Southern California urban housing sprawl. It's just a loss." Others were relieved that major portions of the desert would not come under tighter rules. "I'm worried about the people who own private land (inside the conservation area), the off-highway users, the ranchers, the miners, the loggers . . . the recreation access to people who just like to go collect rocks," said Chuck Cushman, head of the American Land Rights Assn. "When you put an overlay of national park-like regulations over these lands, you just cut off Americans from those lands." Although staff members for U.S. Rep. Mary Bono (R- Palm Springs) say she is reluctant to amend the House bill to include the California land, Sen. Dianne Feinstein (D-Calif.) said she will push to fix the 7-milllion-acre "glitch" in the Senate version. In many cases, bureau land is open to multiple uses, including mining, grazing and off-road driving. There are no guided tours and few rangers. Officials said that management approach would remain on the national landscape lands. "There is hunting. There will be no hotels. You can camp pretty much anywhere you want," said Elena Daly, head of the bureau's program that could win permanent protection from Congress. She said the program also stresses collaboration with local communities, including "sustainable ranching." Daniel Pfiefer of Costa Mesa is torn by the proposed legislation. Pfiefer, who had just finished a three-day off-road trip along the ancient Mojave trail this week, said he appreciates the difference between national park and land bureau conservation lands. "We came through some national parks areas. You cannot get off any road at all. You can't even have a ground fire in national parks . . . But the BLM areas are very friendly. They don't want you driving out all over the place, it's a 'tread softly' kind of thing. I'm very happy with the way it is right now." Although he hates the way rogue off-roaders "trash" pristine areas by cutting illegal paths and dumping garbage, the bill proposed by Congress, he said, makes him nervous. "As a person that absolutely hates rules and regulations myself, I have such a difficult time with it, because I do so much love the outdoors, and I do so much love going out and Jeeping across the trails. "Being an off-roading enthusiast, it scares me to think that if the federal government starts putting their fingers into it, and start sectioning off any portions of the desert, then closing it off is not far behind." The national landscape conservation system was created in 2000 by outgoing Interior Secretary Bruce Babbitt to pull together and protect hundreds of conservation areas, monuments, wilderness study areas and other "orphans" of the federal bureau. All of the bureau's California desert lands were included. Unlike the proposed law, Babbit's executive order can be rescinded by the current or future Interior secretary. "A constant threat is that it could be dissolved and dismantled at any point in time, with the many properties truly becoming 'orphans,' " Ian Wilson, spokesman for the nonprofit Sonoran Institute, a Tucson-based environmental policy group, said about California's desert area. Interior Secretary Dirk Kempthorne supports the bill as written. A broad coalition of more than 70 outdoor sports, environmental, historical preservation and religious groups is pushing for passage of the legislation, which would also establish a line item in the federal budget for annual funding. Currently the program receives $50 million a year. "I think we are all about to witness the next major conservation system for the United States," said Daly on a recent tour of several program sites, including the Las Cienegas National Conservation Area grasslands that stretch for 48,000 acres outside of Tucson. It is hard to see the difference on the ground between some of the included and excluded areas. The Las Cienegas area is named for the Hundred Waters creek that flows across the Sonoran desert floor between mountain ranges in the Sky Island region, its willow and cottonwood-lined banks providing shade and forage for 230 bird species. " Oklahoma" and "Red River" were filmed on the sweeping grasslands decades ago, and ranchers and land bureau managers have laboriously ripped out invasive mesquite that is overtaking the grasses. Five hundred miles to the west, the Mojave River bubbles up out of the parched desert in Afton Canyon, nourishing more than 180 bird species. Hundreds of films, including "Letters From Iwo Jima," and "Kill Bill" were filmed in the desert area. Daly says it's not her job to tell Congress whether some or all of California's deserts should be included. But she said it's not too late for the omitted lands to be added, if that's what Congress wants. "The bill is in draft form," she said. "It's not a done deal." This article was published in the Las Vegas Review-Journal on January 27, 2008. The stone ruins of old Fort Piute overlook a spring and vegetation-filled canyon at the eastern edge of the Mojave National Preserve. One of the few sources of reliable water in the Mojave Desert, Piute Spring and its half-mile long stream drew overland travelers for many centuries. Today, the remote site draws only dedicated hikers and back road explorers seeking glimpses of the past. 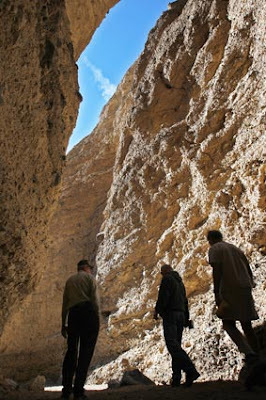 Visitors approach the canyon and fort on foot, either from the west on roads within the Mojave National Preserve or from U.S. 95 to the east on obscure side roads. Use high-clearance vehicles or those with four-wheel drive. 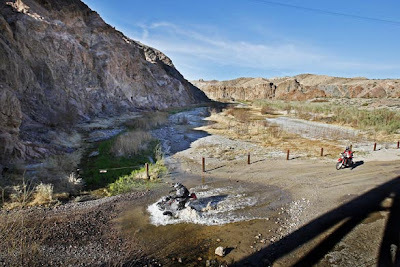 To reach Piute Canyon from U.S. 95, drive a little more than six miles south of the junction with Highway 163, the road to Laughlin. Watch for a graded road heading west. Follow it about seven miles to a power line road, where you turn north for about a mile and a half. Watch for two rock cairns marking the turnoff onto the canyon road, a very rough track. You may have to park and walk the two miles to the ruins of the 1800s fort near the mouth of the canyon. Visitors within the preserve follow a graded utility road from the junction of Cedar Canyon Road and Lanfair Road east nine and a half miles to a smaller road leading to a corral. North of the cattle guard, look for rock cairns marking two different foot paths to Piute Canyon, a trip totaling about six and a half miles round-trip. Young people from the California Conservation Corps spent time improving the rough canyon trail last year. Natives of prehistory visited frequently. Hunters stalked the wildlife attracted to the water and vegetation. Farmers diverted the stream into irrigation channels for their tiny patches of corn, beans, squash and cotton. Seasonally, they gleaned a variety of natural foods and plant products. They left scattered petroglyphs on boulders to mark the importance of the oasis. The site witnessed a parade led by native groups who established foot trails for long distance trading routes long before the arrival of white settlers. When a Spanish exploration party including Father Francisco Garces ventured into the area seeking a route to the coast in the 1700s, local Mojave and neighboring Chemehueve tribes assisted and accompanied them. The natives met the first exploring fur trappers cordially in the 1820s. Later relations with encroaching whites turned much less hospitable. 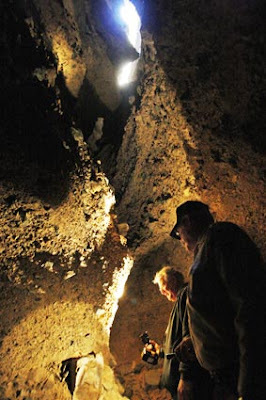 The ancient route past Piute Creek carried no stranger travelers than the experimental camel caravan led across the desert in 1857-58 by soldier-surveyor-explorer Edward F. Beale. Camels subsequently served as beasts of burden in arid parts of the West for several decades in the late 1800s, including Nevada. Although Beale and his camels encountered no hostile natives, an emigrant train across the Colorado River in Arizona was massacred in the fall of 1858. The incident led to the 1859 construction of Camp Colorado, later Fort Mojave, on the river 22 miles east of Piute Canyon. That year, hostiles also attacked a military expedition passing through the canyon. In 1859-60, the army established a chain of redoubts across the Mojave Desert. The first one west of Fort Mojave at Painter [sic] Creek was first called Fort Beale, but later renamed Fort Piute. Outposts to the west about 20 miles apart included forts at Rock Spring and Soda Spring. Fort Piute housed 18 soldiers and their officers. Ruins of rock-walled buildings, passageways and corrals remain. The thick stone walls contained defensive rifle ports and metal deflecting shields. The larger of two buildings contained three rooms and a fireplace within walls measuring 25 by 60 feet. The army manned the fort until the outbreak of the Civil War in 1861. California Volunteers re-manned it in 1863. Returning in 1866, the army used it through 1868. Later, the post became a relay station for the overland mail where stagecoaches changed horse teams. The steep, rough section of government road through Piute Canyon often put passengers afoot, even the sick or wounded. When steamboats began to ply the Colorado River and railroads finally crossed the Mojave, the centuries-old trail became a nearly forgotten path.